Here at 3redbags events, we absolutely love the creative side of our wedding planning process. One element of your wedding day that gives us a great chance to play, is the wedding guest book. Yes, you can find some very nice designs to choose from for your guest book, but why not shake it up a little and avoid having just another guest book? From custom made wooden hearts, to fingerprints on canvas, below is a collection of some of our past real weddings guest book ideas. You will find inspiration for your wedding and most of our designs are very easy to replicate, so you can have a little DIY project for your wedding if you wish! A super easy idea to get your guests involved, this printable is easy to get, set-up and then frame for a lifetime. This thumbprint guest book is perfect for a mini DIY project, all you need is a printer, some paper, ink and a little creativity. Let your guests give you a piece of their heart! 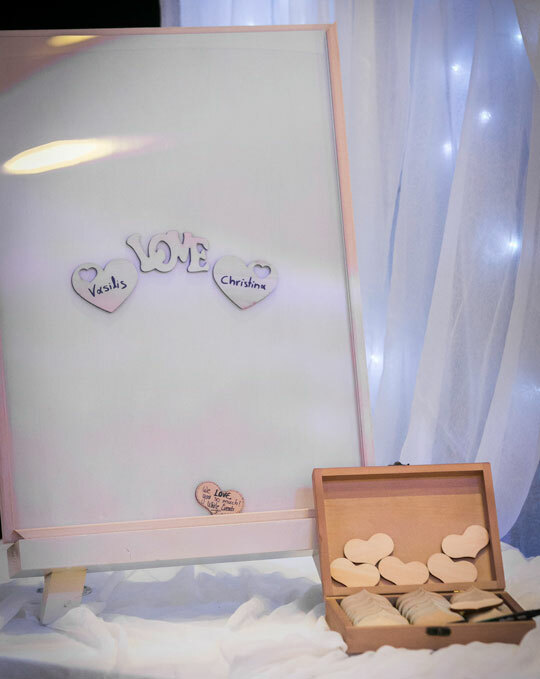 With our custom cut wooden hearts, your guests can write their wishes and share them with you in a frame. You are then left with a great frame full of warm wishes. We are sure this will have a special place in your home. Here we used it for the wedding of Vassili & Christina in Rhodes. For playful, funky, out of the norm weddings, here’s an idea that will blow you away. 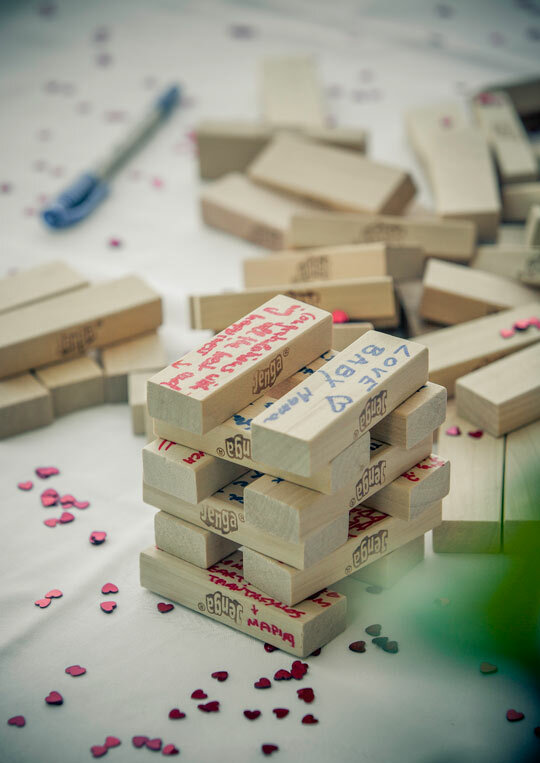 When the couple loves party games with friends, come up with a Jenga for their wedding wishes. 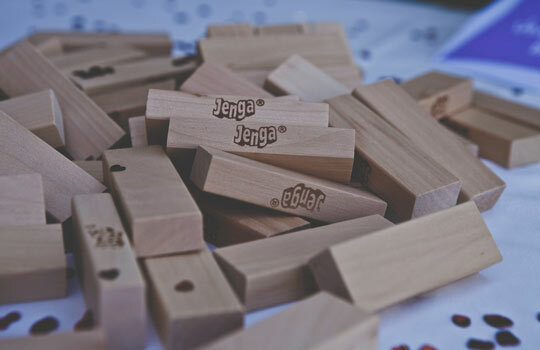 Simply lay out the bricks with some instructions and get everyone writing wishes and building the Jenga tower. The wedding guest book is a great way to extend your wedding theme and match your overall style. Don’t overlook it! 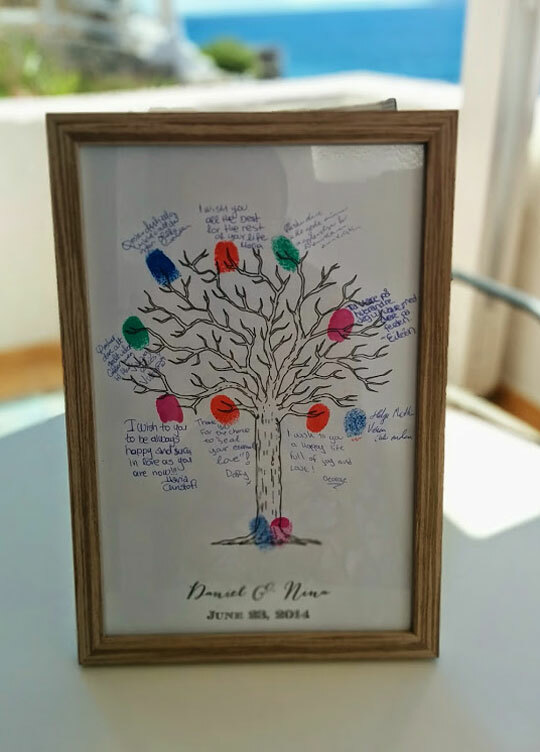 Do you have some ideas for your wedding guest book? Why not share them with us in the comments section below? Wedding planner tip: We always create a comfortable corner to set-up the wedding guest book. It needs to be a little further away from the party as your guests need to take a moment to relax, maybe grab a treat, and write their wish. Maria’s creativity elevates your event. Her bespoke designs, trend research and wedding ideas, create a special day that stays with you forever. Also known as the mood board queen! Need a wedding designer for your wedding in Greece? Contact her today!